Penelitian - In response to herbivores, plants emit a mixture of volatile organic compounds which include volatile green leaves (GLVs) and terpenoids. This volatile is known to attract natural enemies of herbivores and is therefore considered to function as an indirect defense. Selection must support herbivores that can suppress these volatile emissions, and thus make themselves less conspicuous for natural enemies. 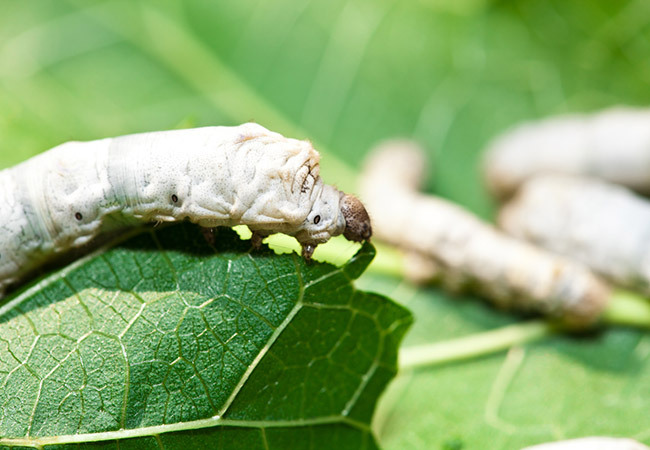 Researchers in Japan have discovered the mechanism of secret defense strategies carried out by silkworms, mulberry and flies. "We tested this possibility for silkworms that were observed leaving secretions from their spinnerets while eating mulberry leaves. When we cut spinnerets from silkworms, no secretions were observed," said Hiroki Takai of Yamaguchi University and colleagues. Leaves filled with intact silkworms release GLV in amounts smaller than leaves filled with ablated silkworms, indicating that spinneret secretion suppresses GLV production. The difference in GLV emissions is also reflected in the response of the behavior of Zenillia dolosa (Tachinidae), a parasitoid fly from silkworms. Flies have fewer eggs when exposed to volatiles from whole silkworm leaves than when exposed to volatiles from leaves full of silkworms. "We identified a new enzyme in the secretions of the spinneret which is responsible for suppressing GLV. The enzyme converted 13(S)-hydroperoxy-(9Z,11E,15Z)-octadecatrienoic acid, intermediates in the GLV biosynthetic pathway, into its keto derivatives in a stereospecific manner," said Takai. This study shows that silkworms are able to feed mulberry secretly by suppressing GLV production with enzymes in their spinneret secretions, which may be a countermeasure against indirect defenses induced by mulberry plants.